WHAT: MOUNTAIN BIKE / HYBRID RAIL-TRAIL TOUR  approximately 225 miles. WHERE: Southern VA and West Virginia (Originates and terminates with shuttle from Washington, DC area). Ride southern section of Greenbriar River Trail, North Caldwell to Marlinton, WV. Overnight in Marlinton, WV. 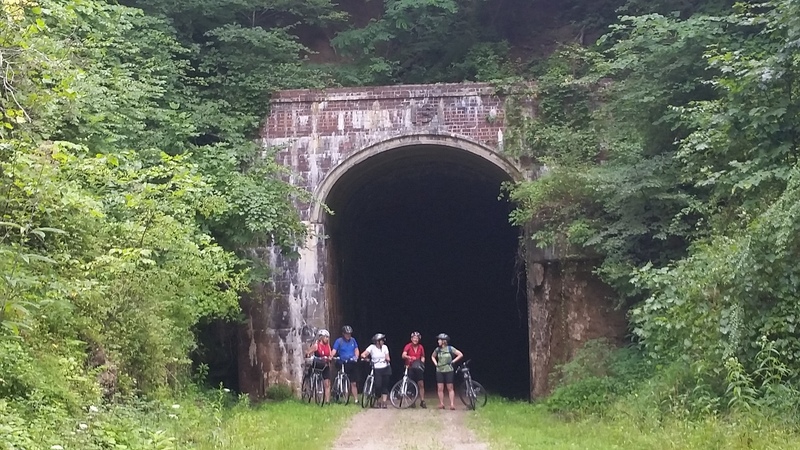 Ride North Bend Rail Trail, Parkersburg to Ellenboro, WV - 13 tunnels highlight the trail. Return to DC area. WHEN: With six or more committed participants, This tour will be scheduled for July 21-27, 2017. Limit: 11. TERRAIN: Level to 3% grade. Packed dirt and crushed stone surfaces, sometimes including packed railroad ballast. 6-8 feet wide. Hybrid, mountain, or cyclo-cross bicycles required. RATING: Easy. When we speak of rail-trails, people can expect that these trails will have gentle or level grades and wide rights of way suitable for bicycling. With bridges over streams and tunnels through hills, rail-trails also offer clear and easy means to negotiate geographic obstacles. Where selected trails change elevation significantly, we have chosen to ride the trails in the downhill direction. Daily distances are easily adjusted to meet varied individual fitness levels. Note: An ordered wait-list will be created once the tour is full..
Tour of the Virginia's is not hard. It uses rail-trails, smooth and flat or with mild grades, even though we are riding through a beautiful, scenic mountain region. The trails for this trip are interesting, and varied. The scenery is outstanding, and the distances moderate. Day 1: The trip begins with charter transportation from near Washington Dulles Airport in Washington, DC's Virginia suburbs, to southern Virginia, departing at 7:00 a.m. and arriving in central for the first trail ride late morning. 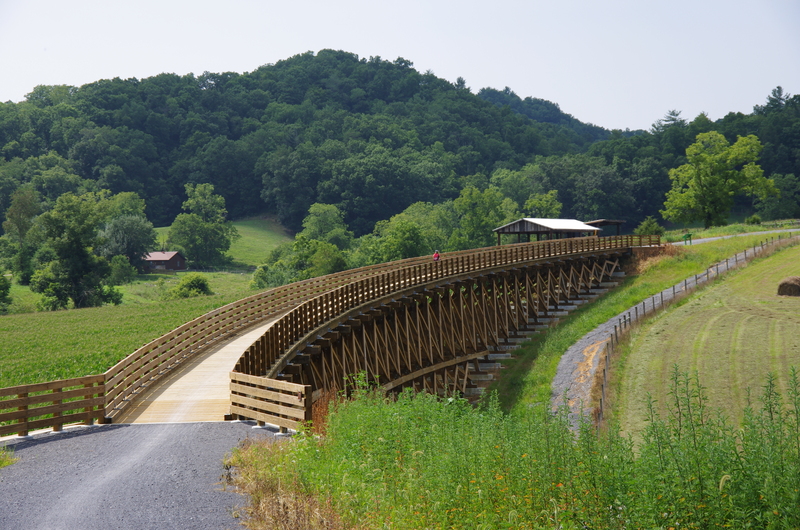 Participants will ride the High Bridge Rail Trail, having trailside lunch about mid-way through the ride, then continue driving south to Abingdon, VA, where we will over-night the first of two nights in Abingdon. Day 2: We shuttle from Abingdon about 1 hour to Whitetop station, at the far end of the Virginia Creeper trail, and you'll soon find that every minute of the shuttle was worthwhile, giving participants time to ride the Virginia Creeper trail downhill from Whitetop Station, VA to Damascus, VA for lunch, and then on to Abingdon, VA. The highlight of this trail is its 47 trestles and the great views from and of the trestles. At the end of the day, we overnight a second time in hotel accommodations in Abingdon, where you can choose to look around town, or relax by the pool. We finish the night with a group italian dinner at a local italian favorite restaurant, and cap it off with Dairy Queen ice cream. Day 3: Following a hearty full-breakfast at the hotel, we shuttle to and spend the third day on the New River Trail, where we ride generally in the downhill direction alongside the New River to Pulaski, VA. Mid-way along the trail, we pass a trail highlight, Shot Tower in the Shot Tower State Park, where we have lunch and hope the tower is open for tours. At the end of the day, you can ride a few miles off-trail (or be shuttled) to the night's hotel in Dunbar, and again choose to look arond town, or relax around the pool. We finish the night with a group dinner. Day 4: After an early, full hot breakfast, another shuttle transports you hours to the start of the Greenbriar River Trail in WV, where you spend day the day riding the southern section of the trail. You will enjoy riding alongside the peaceful Greenbriar river, known to present deer, bear, and other wildlife viewing for trail users. 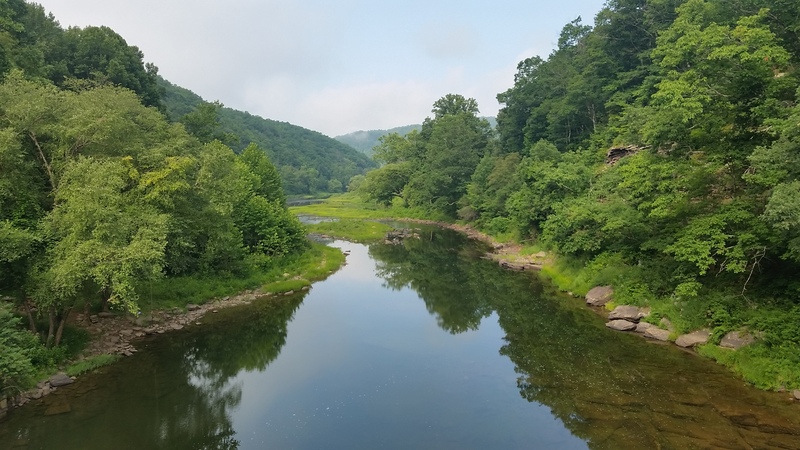 The trail traverses lush farmland, as well as Watoga State Park and one highlight of this section is the Droop Mountain Tunnel, which lets you know that you are riding into the steep mountain region of West Virginia. Enjoy window shopping in Marlinton, or just poking around the small mountain town and soaking in all the old buildings, mural art, and country flavor, before we have a group dinner in the local cafe, and overnight at the Old Clark Inn, the town's premier B&B accommodation, right alongside the Greenbriar River. 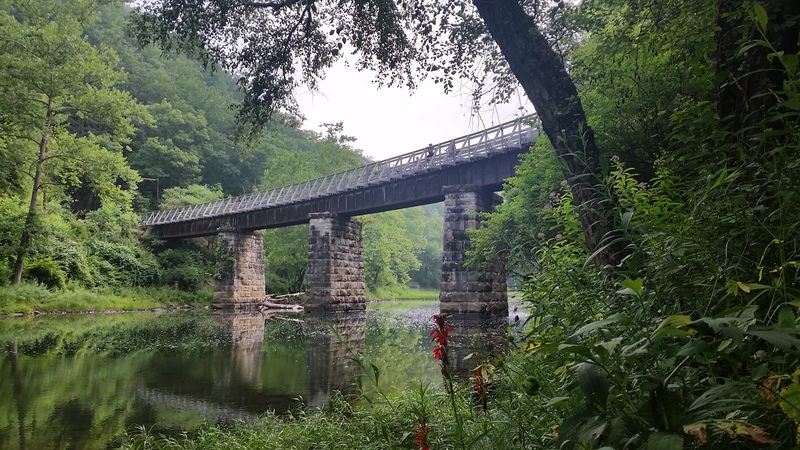 Day 5: We'll eat another early breakfast and get going this morning, to enjoy the northern section of the Greenbriar River trail, including an interesting trestle-tunnel combination, as we climb notably through the mountains, with spectacular up-river views all the way to Cass, WV. All aboooard! This afternoon, we have an experience like no other, as we travel on a train powered by a 1920's steam locomotive through an historic logging town,15 miles up the mountain to the top of Spruce Knob, which is rich with views of the highest West Virginia mountains. While the train stops for guests to enjoy the mountain vistas. On return to Cass, we will allot some time to visit the Company Store and museum, before movig up the road a bit for hotel lodging in Elkins, WV. Day 6: We'll have another exhilarating day today, with options for group consideration. Before transiting to Parkersburg, WV for our final night, there are two rail trail options we will shuttle to. 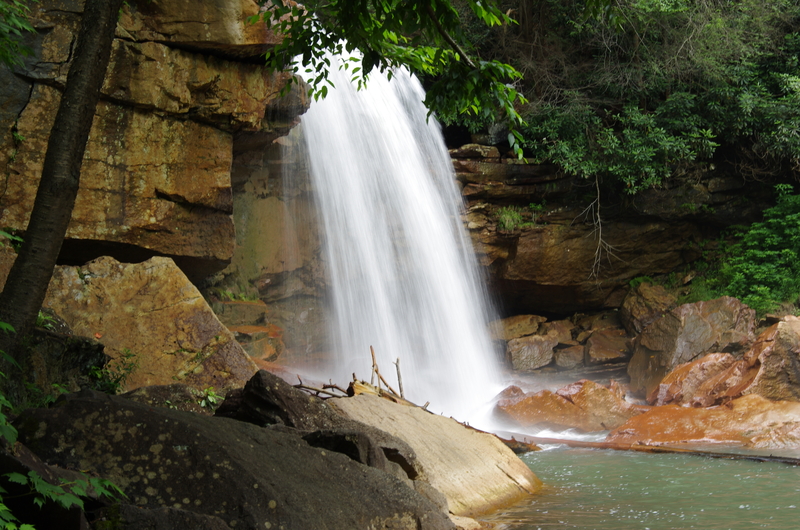 Our choices include the rugged and remote, but beautiful Blackwater Canyon Rail-Trail, a 10 mile, 2,227' downhill, single-track ride into the Blackwater Canyon from Thomas to Hendricks, and/or the Allegheny Highlands Rail-Trail, which starts where the Blackwater Canyon Rail Trail ends, and travels 24 generally downhill miles back to Elkins, WV. These trails are scenic, but none seem to match the grand views of the Blackwater Canyon waterfalls (note: this trail is now unmaintained and as such is a moderately technical singletrack ride with some vegetation growth encroaching the trail, and some fallen trees). After whatever riding the group elects, we will spend the balance of the afternoon/evening in transit to Parkersburg, WV, where we will overnight in the luxurious Blennerhassett Hotel, a fabulous historic hotel built in the 1890's, and decorated with antiques. 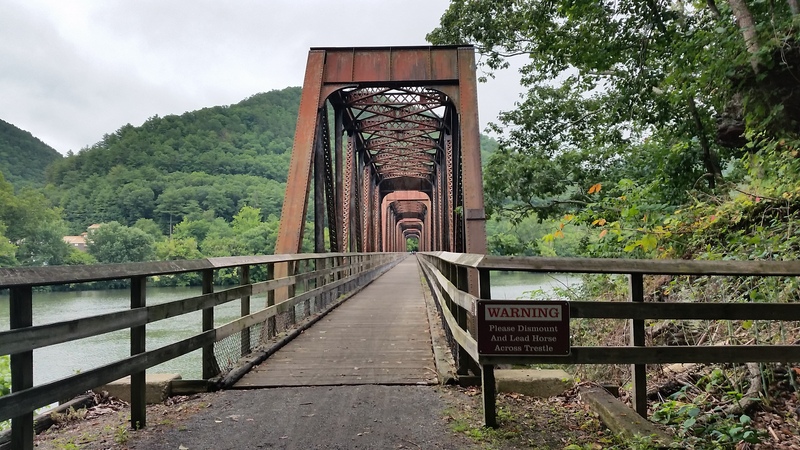 Day 7: On our final day, we tackle the North Bend Rail Trail, a fascinating 70 mile gem in western West Virginia, that showcases 13 tunnels, each of unique architecture and character, and a number of trestles. This day may be shortened after the most scenic parts and tunnels have passed, depending on group comfort and desire. As a linear trail, easily accessed by support, perhaps the stronger cyclists will ride closer to the entire 70 miles in our allotted time, while others ride the planned distance of 60 miles or a bit less. Upon reaching Wolf's Summit, or at our agreed upon time limit, we will load up for the return to Washington, stopping for dinner, and returning between 8:00 and 10:00 p.m.
15-60 miles per day, with shuttle options to shorten daily distances. The support vehicle will shuttle participants between the daily endpoint and the next day's starting location on most days, and will also meet riders at pre-determined support points along the trail. Daily transports range between 1 and 3 hours, except the drive down and drive back. Trip meals are provided and are included in the trip cost. See Frequently Asked Questions at the "FAQs" link, for answers to common questions.